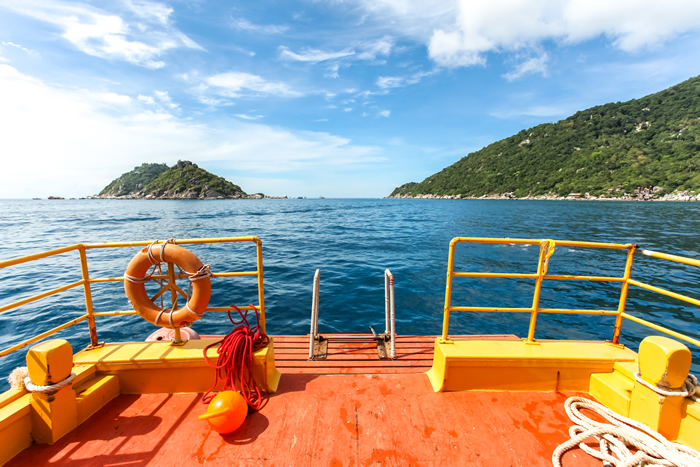 Koh Tao in Thailand is the most successful dive training location in the World! 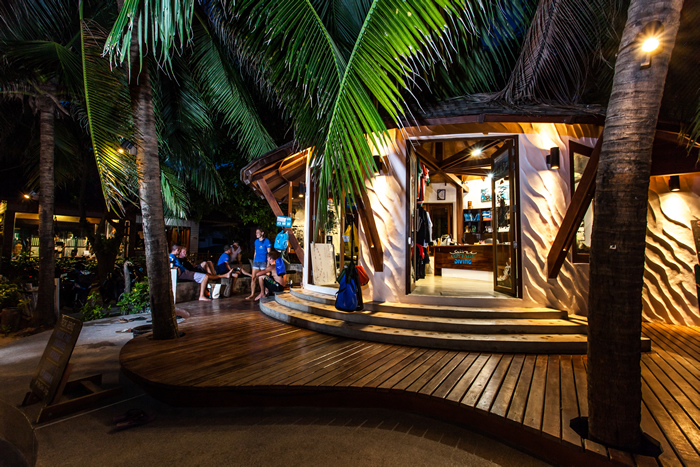 Join our PADI Dive Instructor Development Course (IDC) Koh Tao Program at Sairee Cottage Diving and be part of one of the fastest growing Dive Centers in Asia! The PADI IDC is the heartbeat of the PADI system. 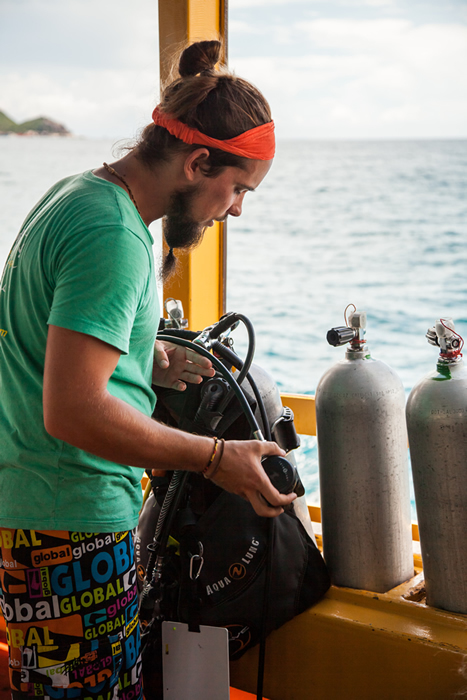 It’s one of the most rewarding experiences of your life and success on the program, will open up a world full of opportunities for you as a PADI professional. Your future career will take you to the most beautiful places in the world, a job that most people only dream of! 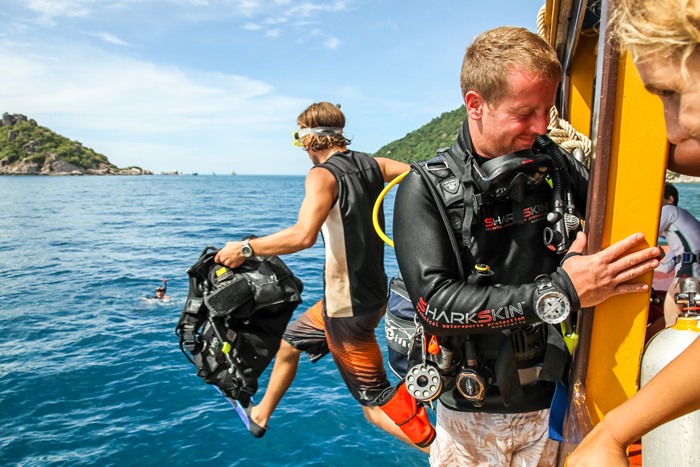 PADI’s Dive Instructor Development Course (IDC) Koh Tao is the final step of the PADI Dive Instructor training process. 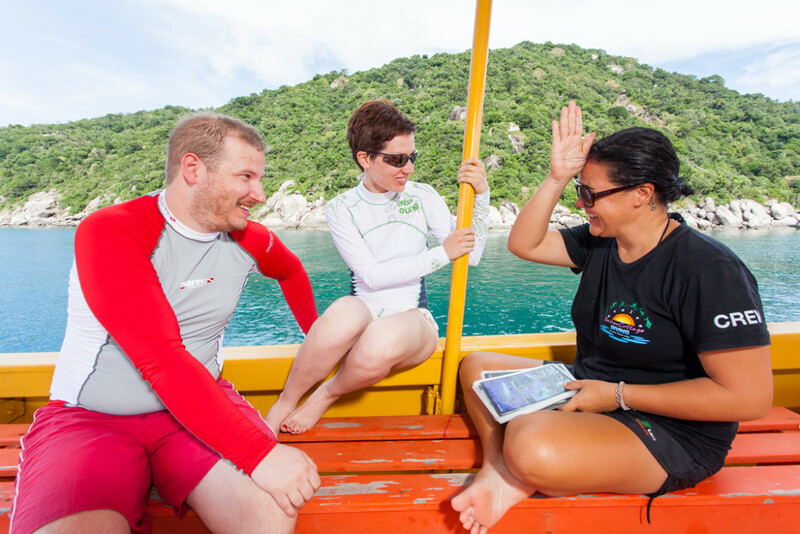 During the PADI IDC at Sairee Cottage Diving, you’ll learn how to utilize and adapt the PADI system of diver education to best meet your student divers individual needs. Whether you’re in the classroom, confined water or conducting an open water presentation, you’ll learn the best techniques and real life teaching tips using the latest PADI multimedia and training aids. 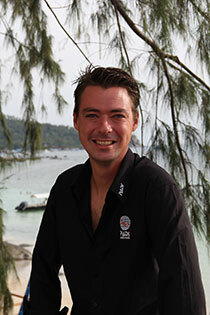 During our IDC, we aim to offer you exceptional training from PADI Course Director Marcel van den Berg. 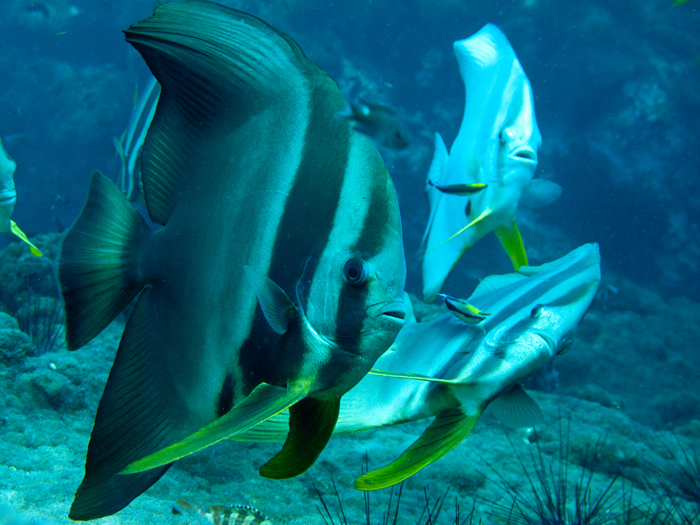 Our 14 day program allows us flexibility and time to focus on your professional development as a PADI Dive Instructor. 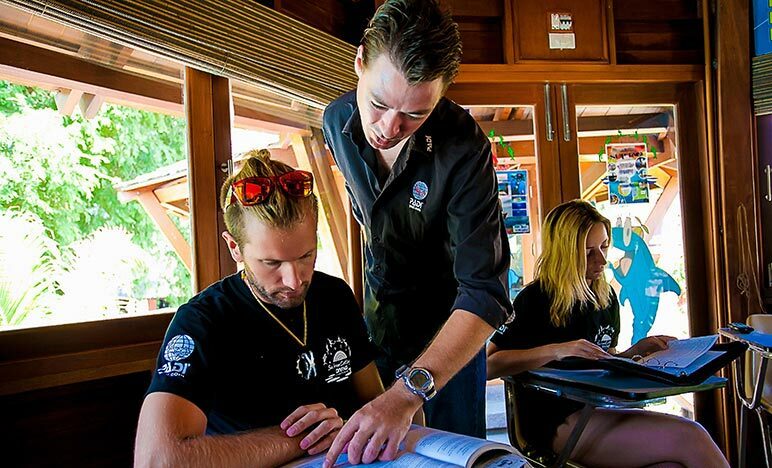 You’ll get the individual attention you’ll need to become a successful PADI pro, not only on Koh Tao, but World Wide! 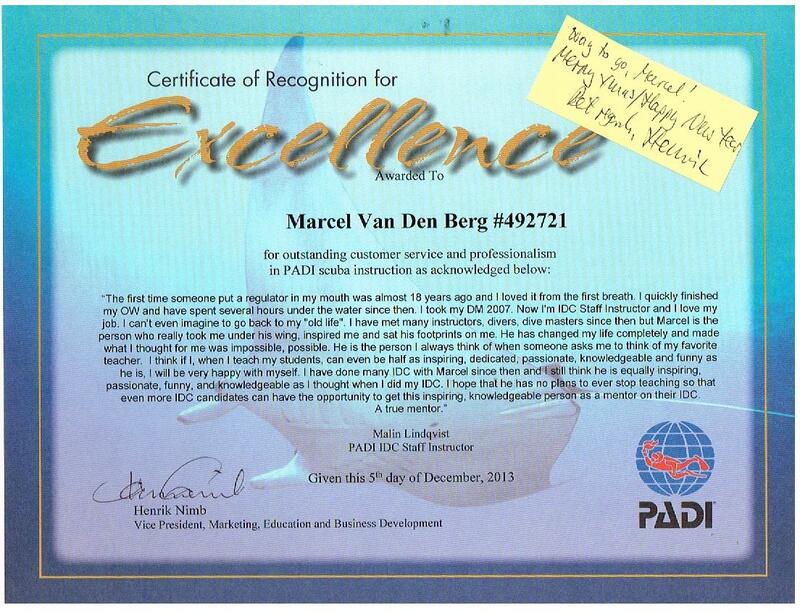 Marcel van den Berg has created an IDC program that goes well beyond the minimum standards, with extra lectures, more topics and more real life training to ensure that you will have a fantastic and successful career in the Dive Industry. 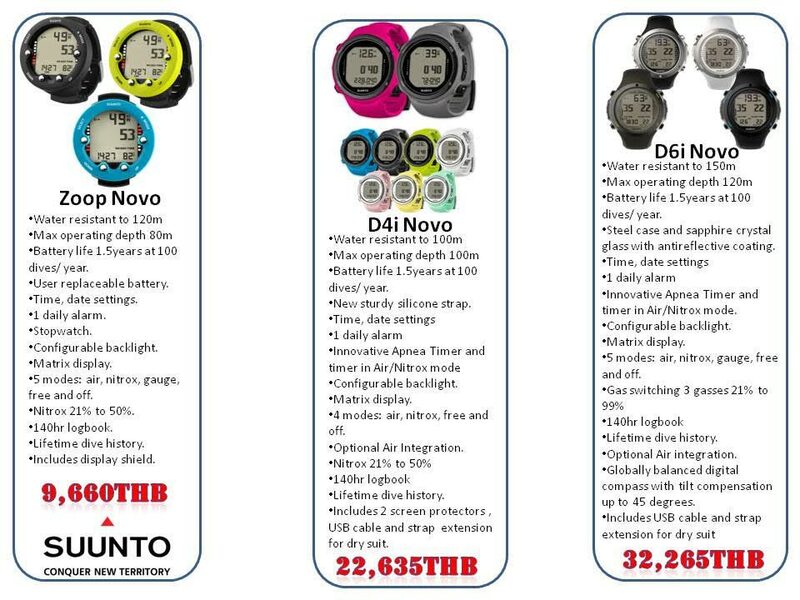 200 THB fun dives (cost price) for the rest of your life! Fun dives are true fun dives and not "Working Dives"
Unique How to teach the best night dive experience workshop! 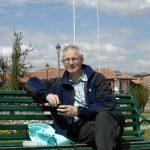 "Let me introduce myself; my name is Marcel van den Berg. 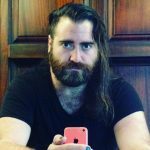 I’m originally from the Netherlands and now living in Thailand for almost a decade. In 2003, I decided to take a diving course to experience the hype that everyone was talking about. 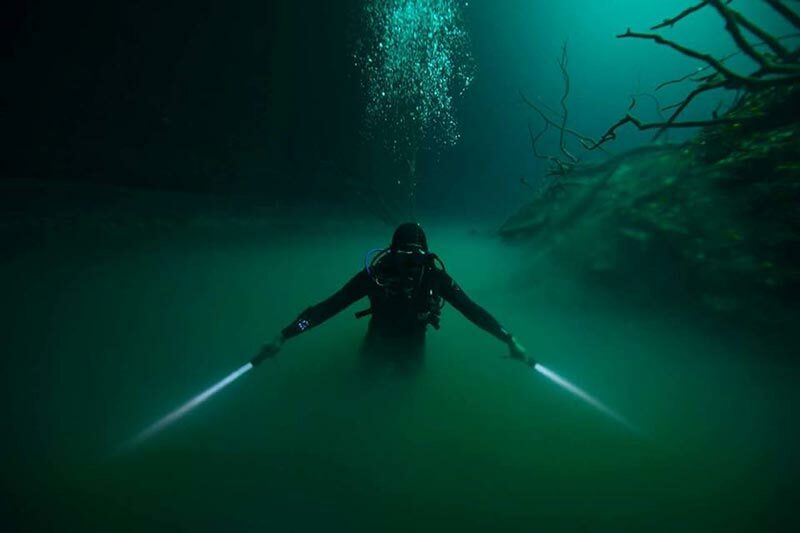 It only took me 20 minutes on my first Open Water dive to realize that you can have fantastic career in this amazing underwater realm. From that moment on, I actively pursued my career in diving. I hold a tremendous passion towards diving which I could share to others during my teaching and turning thousands of students into divers. It didn’t take long to decide to advance in my career and continued my education towards Course Director and Specialty Dive Instructor Trainer. 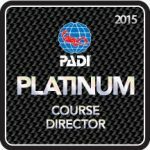 Within the first year I achieved Platinum Status from PADI and kept that until this Day. Now I’m able to teach the success I had to new Divemasters and Dive Instructors and I look forward to share my passion and success in Diving with you! 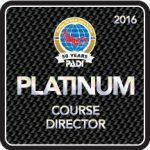 Taught over 4000+ students on all PADI levels. Sairee Cottage’s IDC is divided into four distinct segments. A 6-day PADI Assistant Diving Instructor (AI) course. This also includes 2 days of Dive Theory presentations as well as a skill circuit where we evaluate your skill set and knowledge before proceeding deeper into the IDC program. 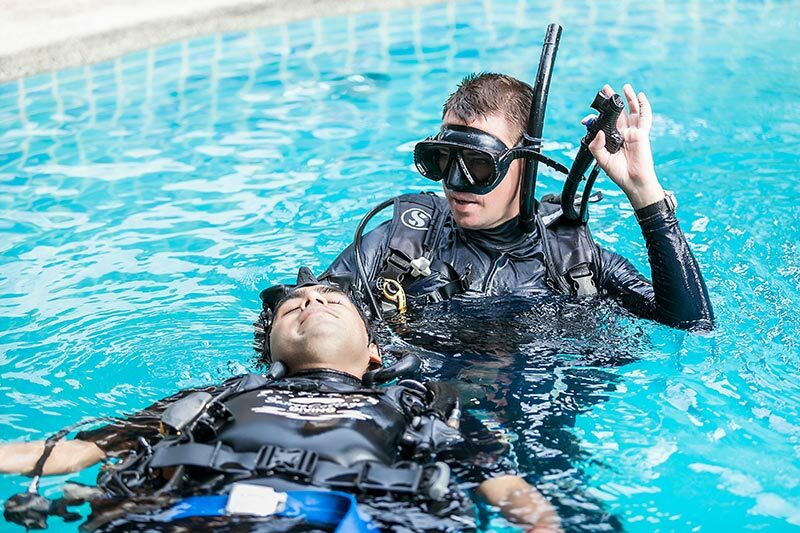 A 5 day PADI Open Water Scuba Diving Instructor (OWSI) course where we evaluate your ability to present in Confined Water, Open Water and in the classroom using the PADI system of Diver Education in the AI section of your IDC. A 2 day MOCK Diving Instructor exam (MOCK IE) which allows us final evaluation of your capabilities as a soon to be PADI Dive Instructor. The 3 day PADI Diving Instructor Exam (IE). This is a standardized, objective evaluation conducted by Dive Instructor Examiners from one of the PADI Head Office’s Worldwide. Our IDC’s are conducted over a 14 day extended time period, with a day off on completion of your AI. This 14 day period allows us plenty of time for individual attention and remediation. Meaning, you get to do more than the bare minimum on your IDC’s. We’ll do additional Skill Circuits, Confined Water, Open Water and Academic Presentations. Workshops on CESA, Navigation, Descents, Search and Recovery (lift bags & Knots) and bring in real life examples of teaching in the real world. 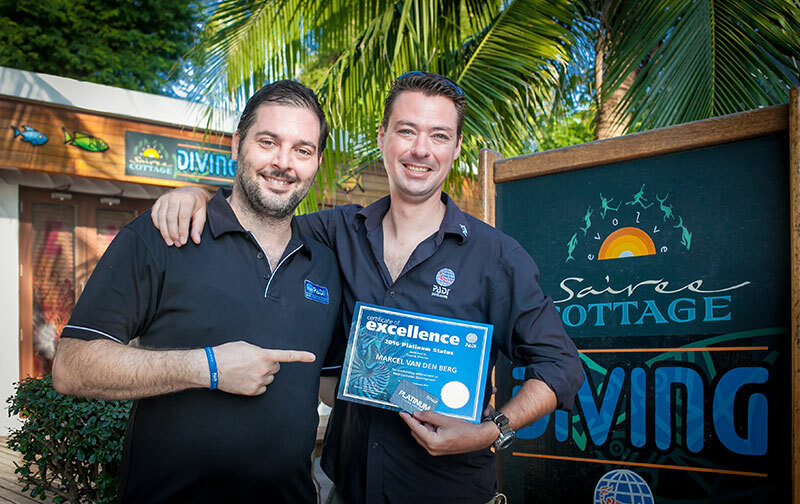 We not only aim to guide you to success on your IE, but also to become a confidant, knowledgeable and skilful Dive educator on completion of your IE. 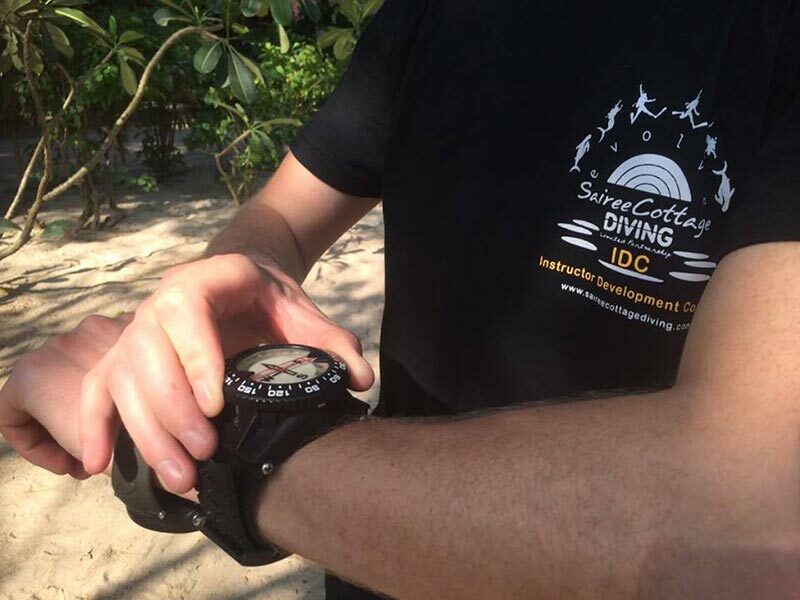 This extra attention to detail and commitment to our IDC candidates means you’ll enter the Dive Instructor Exam feeling super confident of success not only on the IE but in your future as a PADI Professional. 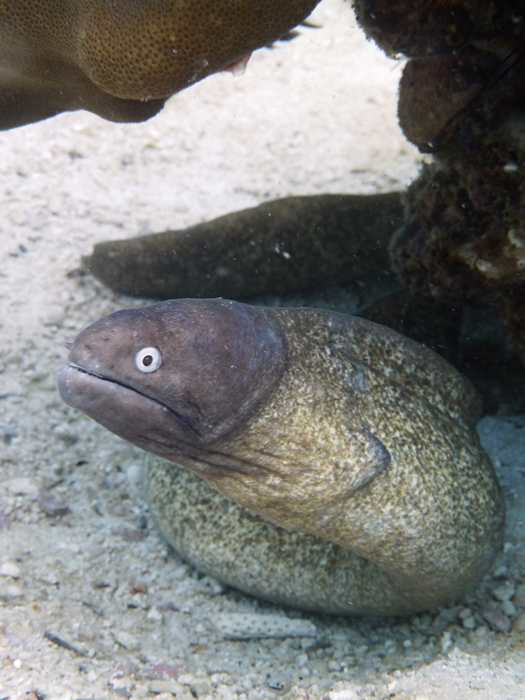 To join an IE, in addition to the above you must have proof of a minimum of 100 logged dives, and have successfully completed the Dive Instructor Development Course (IDC). Revise the five theory topics (Physics, Physiology, Equipment, Dive Skills and the Environment, Recreational Dive Planner), using the Encyclopedia of Recreational Diving and Diving Knowledge Workbook, or enroll online for Dive Theory eLearning. As this is not part of the IDC Curriculum, a good understanding of Dive Theory is necessary. We will be evaluating you in this area throughout your IDC, and remediating where necessary, so please come prepared. Make sure you have the latest version of the PADI Dive Instructor Manual or update yours with the latest Training Bulletins. You would of received an Dive Instructor Manual with your Divemaster Crewpak. As well, if you’ve set yourself up an account, you can download the most current version from the PADI pro site. The Sairee Cottage Diving IDC Course will give you amazing personal attention, real life teaching experiences, eco conservation, advanced risk management, extra help finding jobs and so much more extra training to ensure your success in your new diving career. Teaching Specialty courses is extremely rewarding, enjoyable and allows you to teach your true passion. 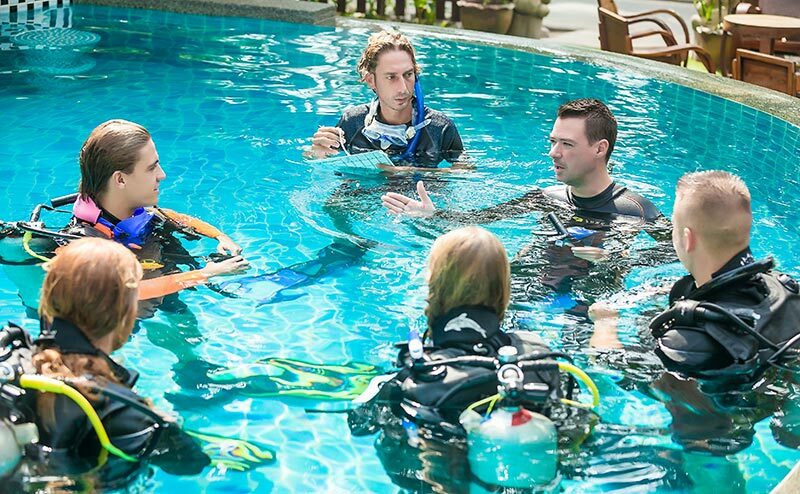 After successful completion of your PADI Dive Instructor Exam, we dedicate our time and focus our energies, on teaching our newest dive educators, how to conduct the PADI specialty programs on our unique PADI MSDT Master Scuba Diver Trainer Specialty Program. 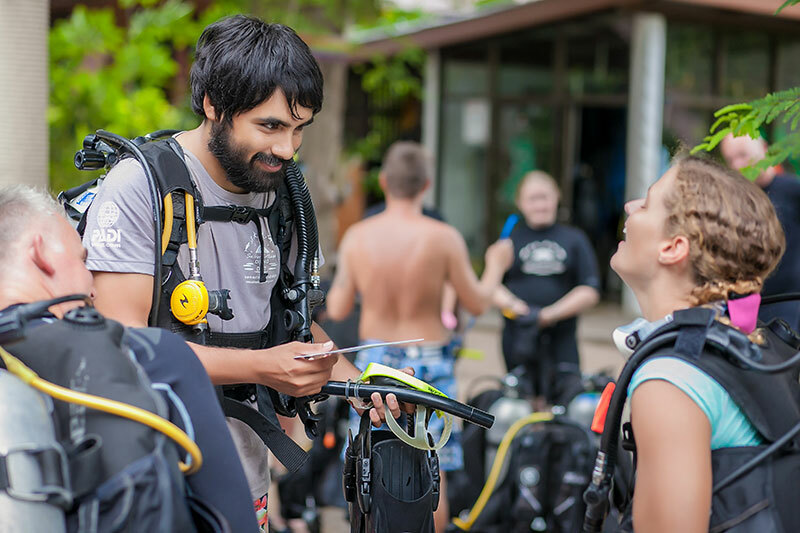 Being a PADI MSDT MASTER SCUBA DIVER TRAINER means you students will be able to learn from an expert in that particularly PADI Specialty Course. 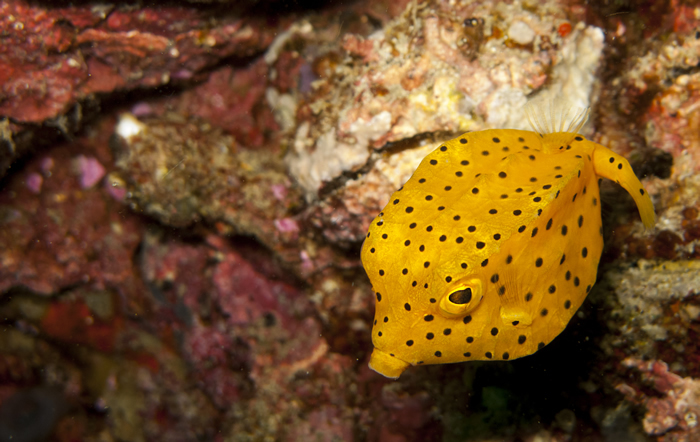 You are able to train student divers so they can reach the pinnacle certification in recreational diving. 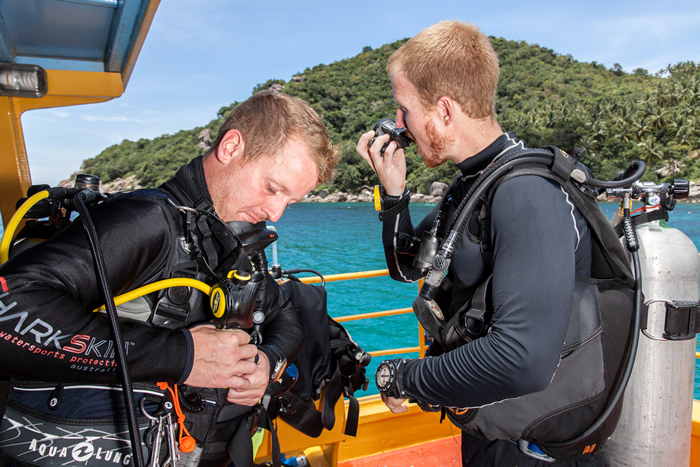 This course starts with the PADI Specialty Dive Instructor Course where you learn how to plan, conduct and market PADI Specialty courses in at least 5 different areas. We cover knowledge development and course standards specific to the areas you choose. 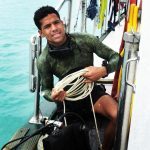 Candidates are also required to present sections of the Academic’s in the classroom, participate in in-water workshops as well as Open water teaching presentations. To be able to send in your application for these specialties you need to have proof of experience of 10 dives in your logbook for that field. 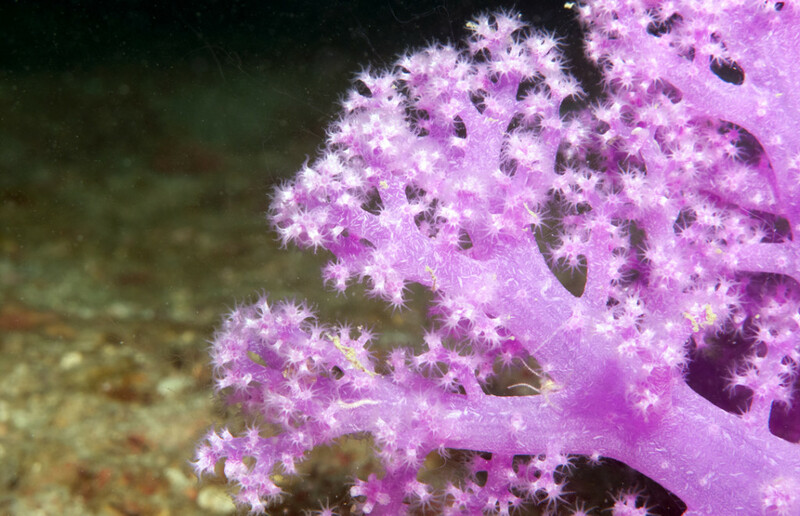 If you do not have these dives then you can get that extra experience with us. Please let us know if you have any questions about this. 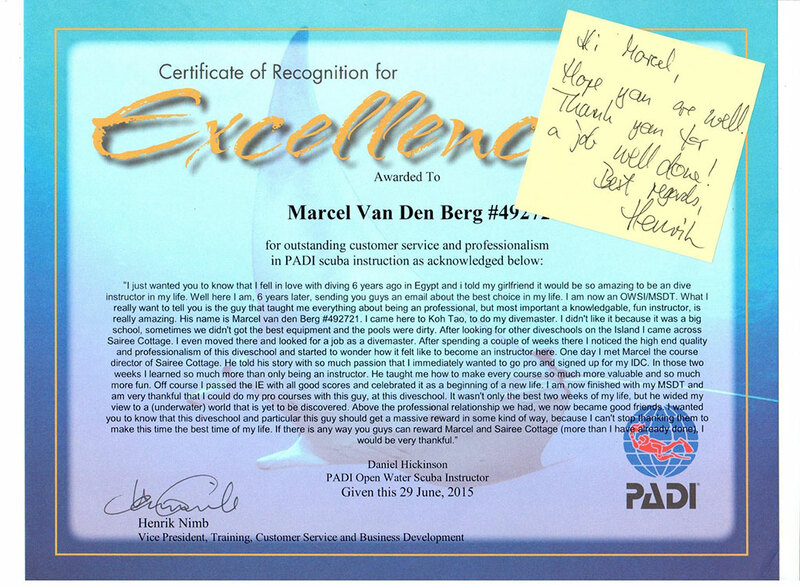 To achieve the full MSDT rating, you need to get 5 PADI specialty ratings and certify 25 students for any PADI course. You can get these 25 certifications by teaching independently after the MSDT course anywhere in the world. Once you have achieved the 25 certifications you can then apply directly to PADI for the MSDT rating. In the mean time you are already allowed to teach the specialties. (Package discount 10% on the MSDT Specialties)! 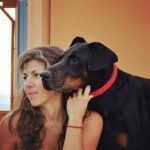 We already teach our PADI IDC and MSDT in an incredibly realistic way, as most other IDC programs are usually taught to only pass the IE Exam with minimal real life teachings. 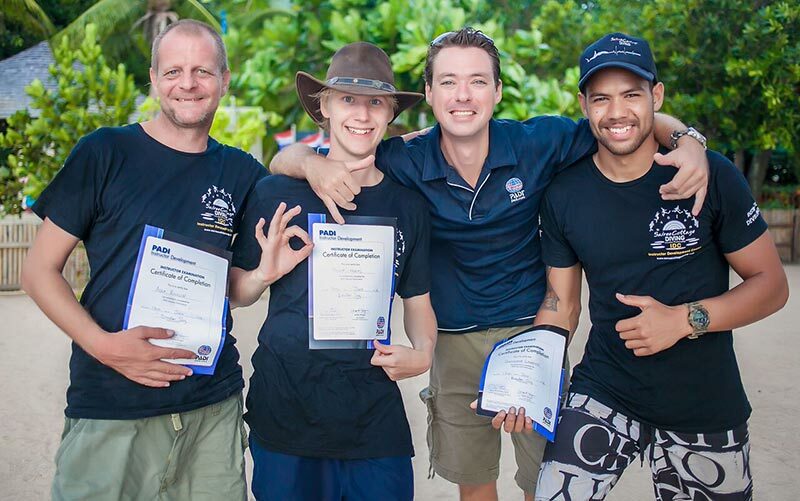 At Sairee Cottage Diving we strongly believe that passing the IE is not that hard with the right training, but it is much more important to learn how to successfully teach in real-life after completing your PADI Instructor Exams. 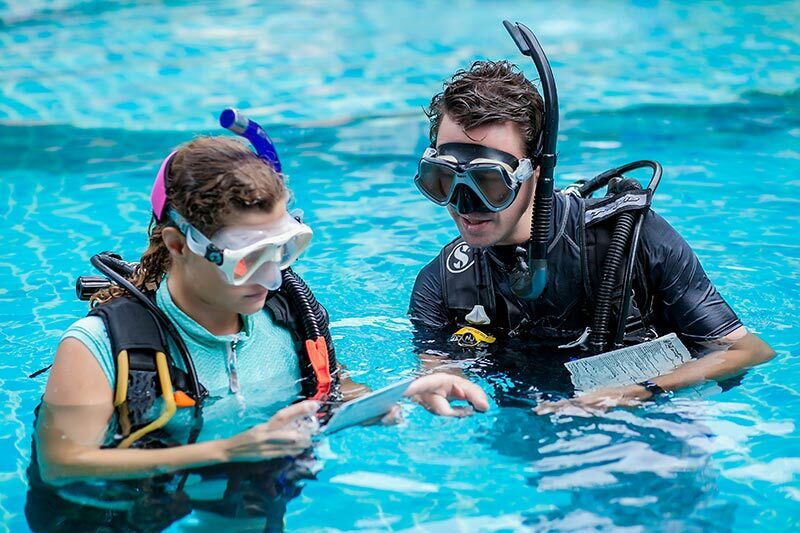 We care succeeding in your future job as a Diving Instructor, so we now offer a free assist on a real life course conducted by an extremely experienced senior staff instructor. Giving you even more real life training to increase your job opportunities significantly after you complete your Instructor course! 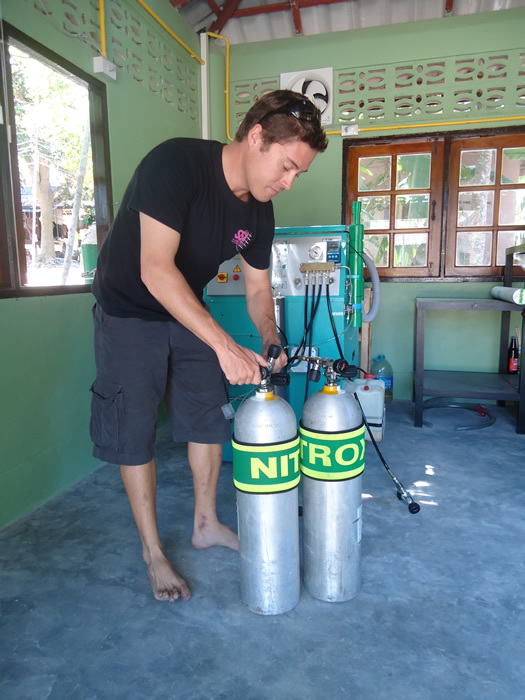 During our PADI Instructor Development Course (IDC) and Master Scuba Diver Trainer (MSDT) Specialties, we do offer to lend you our shop equipment for free. Except for a Dive Knife and a SMB. (which you can buy here, if needed). 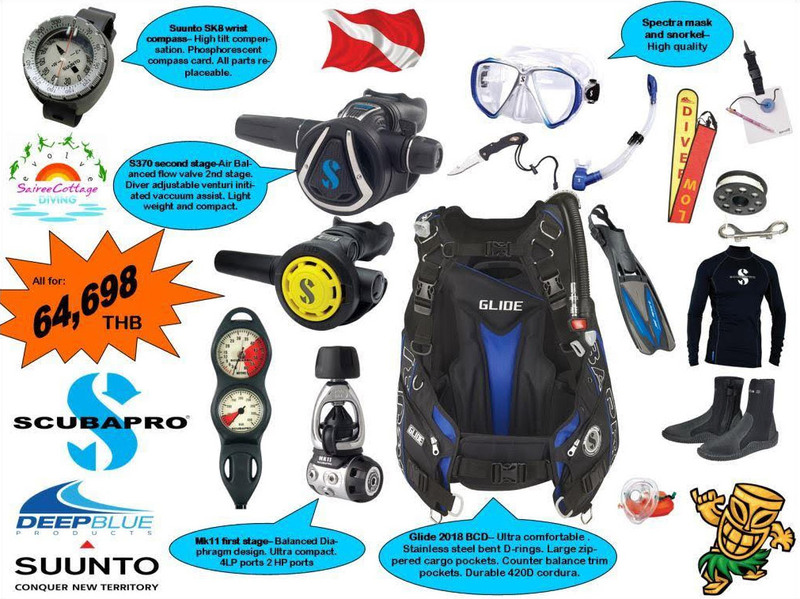 However it will always be more comfortable and convenient to have your own equipment; and if you want to work in the dive industry, staff have to have their own kit as a rule in nearly all dive companies. 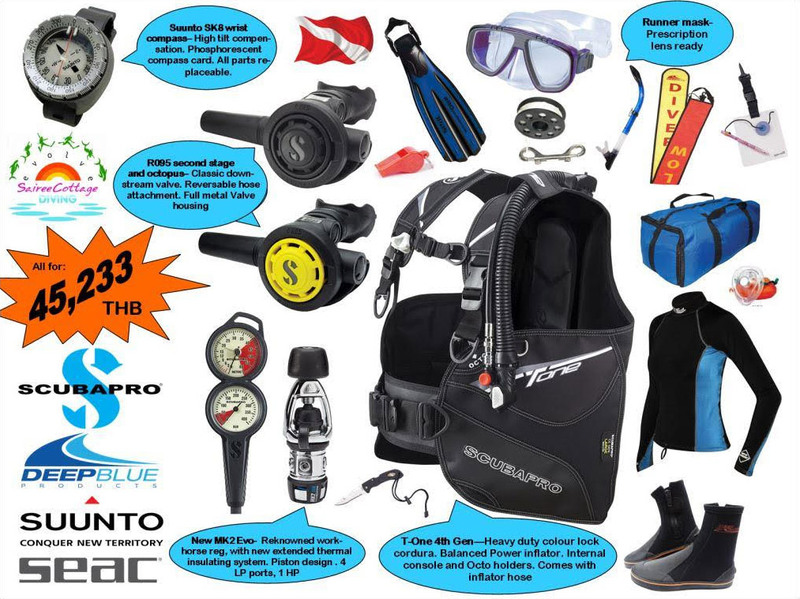 So start your new dive career straight away with a brand new set of Professional Dive Gear. 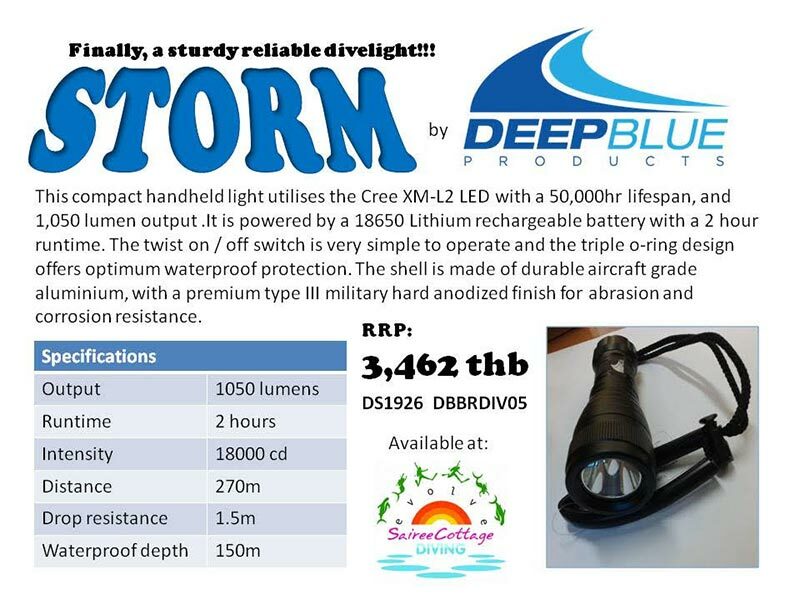 We have created 3 fantastic, very reasonably priced, diving equipment packages to suit all budgets: The Silver, Gold and the Platinum Dive Equipment Package! 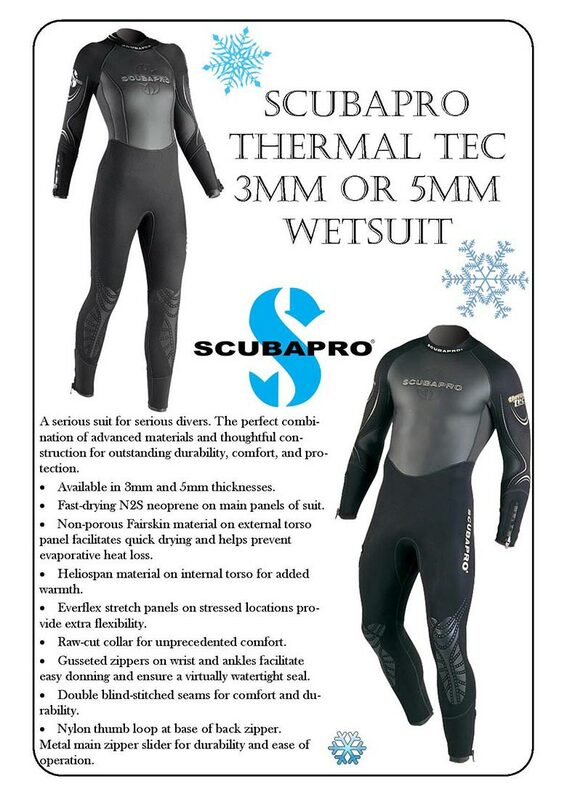 We also offer separate Scuba Pro Wetsuits and Suunto Dive Computers. 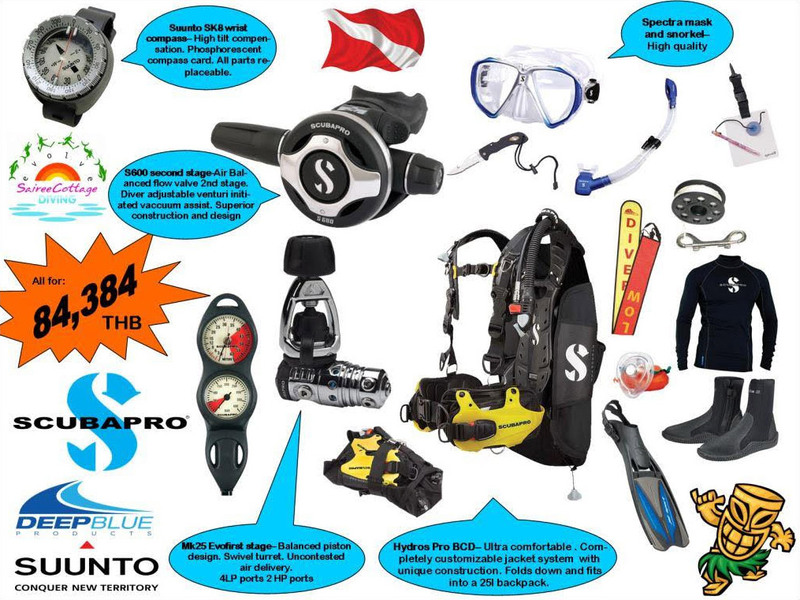 There is a 15% discount included in these dive gear packages if you pre-order this equipment with your Dive Instructor Package. You can always change items here on arrival if you want. Please contact us for more information. 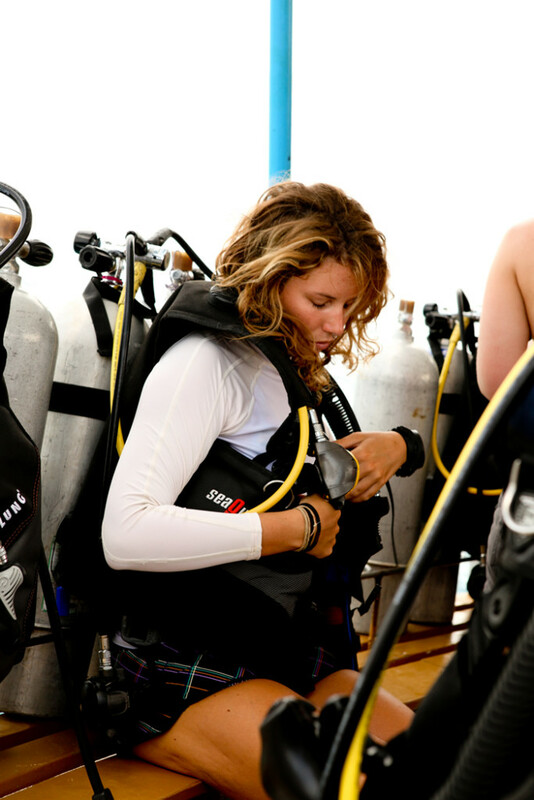 Want more information on becoming a Dive Instructor? Start a conversation with us. We are glad to help.